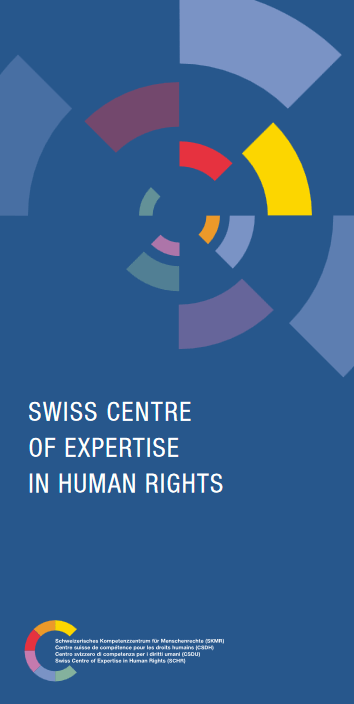 The Swiss Centre of Expertise in Human Rights (SCHR) is a pilot project on behalf of the Federal Government. It aims at promoting the implementation of international human rights obligations in Switzerland and at advising and supporting the authorities, the civil society and the economy. The SCHR is a service centre with proven experience in human rights particularly in the areas of migration, police and justice, gender policy, children and youth policy, institutional issues as well as human rights and the economy. The SCHR offers practice-oriented studies; expert opinions, conferences and courses and provides information. In this way the SCHR wants to increase the authority of the various Swiss actors in the field of human rights promotion and protection, and to initiate the public discussion on human rights. The SCHR is a broadly supported network of university institutes which includes the Universities of Bern, Neuchatel, Fribourg, Geneva and Zurich. From 2011 to 2015 the SCHR was chaired by Prof. Walter Kälin. Since January 2016, the SCHR is chaired by Prof. Jörg Künzli of the institute for Public Law at the University of Bern. The services of the SCHR are directed at public authorities, NGOs and actors in the economy. Inquiries should be directed to the Secretariat in Bern. However, the SCHR offers no individual counselling. Individuals looking for advice and assistance should contact a professional advisory institution. The SCHR receives a basic yearly funding from the Federal Government in return for which the SCHR provides services to the Confederation defined on a yearly basis. In addition, the SCHR receives mandates from public authorities, NGOs and the private sector. The participating network institutions also contribute own resources. The mandate of the SCHR, initially limited to a pilot phase from 2011 to 2015, was extended by the Federal Council on 1 July 2015. The SCHR will continue its activities until the establishment of a successor institution, or a maximum of five years from early 2016 onwards.